A LOCAL exporter has criticised New Zealand's strengthening of its Hazardous Substance Act, saying it would devastate Fiji dalo farmers, suppliers and exporters. Dalo exporter Alf Hazelman said the Act was passed in 1996 but last year, authorities decided to strengthen the law while assessing imports. "The way they are going, it will not be long before New Zealand stops buying our dalo." He said at the moment if they found a live insect on imports, the product was fumigated to kill any other living insect. Mr Hazelman said the practice was conducted here but local officers tried not to use the process all the time. He said exporters from Tonga and the Cook Islands would be affected by the amendment. "Something should be done about the problem because there are a few islands and places in the country that plant dalo extensively and depend on the income for their living," he said. The Pacific Island Trade and Investment Commission warned dalo could be a luxury item if importers stopped bringing in the root crop because of the cost associated with the Act and a new Organism Act. VANUATU kava will not be banned from Fiji, says Fiji Kava Council president Ratu Josateki Nawalowalo. He said that Germany's lifting of a kava ban was subject to certain conditions. "We have been given time from now until June 2007 to carry out tests to prove the positive effects of kava on health users and present the results to Germany." He said they were working with the International Kava Council to fulfil the conditions. In a letter to The Fiji Times, Dave Aidney, the German Consul to Fiji explained that Germany had not lifted the kava ban but changed it to an interruption of licence. "It means that kava can still not be sold as a medicine in Germany but if the argument is convincing and conclusive, the licence could be reinstated," he said. Ratu Josateki said Fiji had a traditional arrangement with Vanuatu to buy kava from them, which would not be broken. "We can't fulfil the demand of the local market, so we buy from other islands. "We've told producers to improve their quality and increase production. "We buy 100 tonnes of kava a month for $6million. If we take away that huge portion, producers will have to improve and fill the gap," he said. In reply to parliamentarian Poseci Bune's description of the effects of Vanuatu kava Ratu Joe said, "we've advised the producers to improve on the quality of kava exported to Fiji. We want to be sure that we're buying kava that is suitable for drinking and not harmful." He said kava bought from Vanuatu would go through proper quarantine examination before being released to the market. TIU Mesulame Penesio has never been beaten on yam planting. The Nakasi High School principal's annual harvest is so much that he has to share it with his siblings and family members. Next month, he has volunteered to feed up to 250 people of his congregation with his yams. The Davuilevu Division is made up of 14 churches. The heaviest yam weighed 126 kilograms and it is a metre long. "I plant yams for two purposes. One is for thanksgiving and the other for Ratu Sukuna Day celebrations where competitions are run in different categories," Penesio said. "The Agriculture officials give prizes and nobody has beaten me so far. People lost hope in competing and the competition died away but I continued planting." He said apart from yams, he planted other crops like pineapple and cassava during his free time. "Teaching is not my priority. I love planting, my second priority is fishing and then teaching." He said he learnt the art from his father in Rotuma. "People say I do witchcraft when planting but I learnt this at a young age from my dad. It's something about the fact that when you plant, you'll reap the results," he said. He has mixed Fijian and Rotuman ways of planting and he says there are special skills in planting yam. Hawaiian varieties of taro will not be used in any University of Hawaii genetic engineering research until native Hawaiians advise scientists about cultural concerns, a university dean said yesterday. The promise is an attempt to stave off controversy and foster dialogue between the university and the native Hawaiian community, said Andrew Hashimoto, dean of the College of Tropical Agriculture and Human Resources. The dialogue is expected to take place through a process being organized by the Royal Order of Kamehameha on all islands. To solidify the promise, Hashimoto signed a one-page statement about the university's intentions with taro research yesterday at a taro patch at the UH Center for Hawaiian Studies. "We have encountered perceptions in the community that CTAHR's taro research focuses entirely on genetic engineering and that the college sells or gives away genetically engineered taro huli (shoots). These perceptions are incorrect," the statement said. "The CTAHR scientists currently involved in genetic engineering research on taro have no plans to modify Hawaiian taro varieties." The only ongoing genetic engineering of taro at the UH is of a Chinese variety and is being done only in a lab setting, not in greenhouses or open fields, Hashimoto said. Genetic engineering involves the placement of a gene from one species of plant or animal into a different species. For example a disease-resistant gene in rice could be added to taro. Genetic engineering is much faster than traditional cross-breeding, Hashimoto said. Opponents of genetic engineering worry that open-field test crops could escape test plots and affect native plants or other nongenetically engineered crops nearby, said Kat Brady of the environmental group Life of the Land. But for taro, the cultural factor is an additional concern. The connection between Hawaiians and taro goes beyond its historical use as a staple food to a "mystical, mythological parable that all Hawaiians are attached," said kumu John Lake, who chanted in Hawaiian, then spoke in English at yesterday's event. "Kalo (taro) is intrinsically part and parcel of Hawaiians and of ohana," he said. In Hawaiian mythology, the gods Wakea and Ho'ohokukalani's first child, Haloanakalaukapalili, was stillborn. When he was buried in the ground, he became the first taro plant, said Nalei Kahakalau, a teacher at the Big Island public charter school Kanu O Ka Aina. The couple's next child, Haloa, was the founder of the Hawaiian people, according to the legend. Visiting students from the Big Island charter school chanted about the legend for those attending the event. The prospect of genetically altering taro is "kind of scary," said Ernest Tottori, president of Honolulu Poi Co., one of the islands' largest taro growers and processors. For example, taro is known to be tolerated by people with allergies to wheat and rice, but Tottori asked what if it lost that quality under genetic engineering? "You want to be very cautious about anything like that," he said. The University of Hawaii signed an agreement today to halt any genetic engineering of Hawaiian taro, until the school and Native Hawaiian groups can discuss its impact. Kalo, or taro, is a staple of the Hawaiian diet, but it's also sacred for Native Hawaiians. The agreement was signed late this afternoon (May 24, 2005), and while it stops genetic modification until there are further discussions, it does not ban it forever. Red tape at the New Zealand border has sent the Pacific's taro industry into a nosedive after agriculture officials decided to apply the letter of the law to fresh produce. Importers are crying foul fearing other products will also be affected, bringing international trade in the region to a virtual stop. The problem starts at New Zealand's borders where taro is a prime target for tougher environmental risk laws. Taro has been so badly affected because its a root crop dug up from the ground where bugs and organisms are found, opposed to a smooth fruit like Mango. The product is also home to a harmless mite called nimotoad but because its a foreign bug its subject to strict quarantine rules every time its found on taro. Peter Kettle from MAF says the mite doesn't appear to pose any sort of threat to New Zealand but they dont have all of the information on it to be absolutely certain. "But the key is, it is against the law to knowingly introduce a new organism," says Kettle. It is costing importers money to get the organism identified and fumigated every time it is found. Alistair Petrie from Turners and Growers says the law has doubled to quadrupled the cost of importing taro and has created huge time delays which causes product deterioration. Petrie says that if it is spread across the range of products that they import, in theory they would have to ban all trade. Importers fear that if the law isn't changed it won't just be taro that will be affected by the law. Farmers in the Pacific are getting hit the hardest - where they used to get $60 for a bag of taro, they now get around $40. Kevin Nalder from the Importers Association says island trade is important to Fiji and other Pacific countries and any costs tend to show up quite heavily. Moves are now underway to simplify the laws, but until that happens the cost of meeting those regulations are being paid for by those who can least afford it. Large-scale rice farming for cash crops is unsustainable and could harm the future production of the Solomon Island’s indigenous staple foods, Kastom Gaden Association (KGA) has warned. The community development NGO has voiced its concern in response to plans by the Solomon Island Department of Agriculture to significantly expand rice production across the provinces. He said the government should be focusing its resources on the production of the Solomon Island’s locally grown staple foods, which far outweigh rice consumption. KGA reports that sweet potato, followed by cassava, banana, taro, coconut, pana and yam make up an estimated 430,000 tonnes of food produced per year. In contrast, only a tiny quantity of rice is grown by villagers through aid supported projects, with production likely to be less than 100 tonnes per year. According to the KGA study, about 23,500 tonnes of rice was imported in the year ending April 30 2004. However, KGA found the consumption of rice is actually falling because of a steadily rising population. For further information, please contact press officer Louise Hunt at Kastom Gaden Association. From Dr Joerg Gruenwald, Executive Director, International Kava Executive Council (IKEC), 24 May 2005. By letter of May 12, 2005, the German health authorities finally decided on the appeal of kava producers against the ban of German registered kava drug products of 2002. The kava ban was revoked, as the German BfArM itself stated, “for reasons of appropriateness”. The decision to revoke the cancellation of drug registrations does, however, not mean that kava is again available on the markets. The registrations in question are inactivated until further notice. The decision to temporarily inactivate kava registrations was based on a riskbenefit evaluation, where the BfArM came to the conclusion of a lack of proofs of anxiolytic efficacy of kava products, with all existing studies either performed with higher than registered dosage schemes, in different indications, or otherwise with a non-controlled study design. The producers were asked to provide new clinical data until June, 2007, in which case a reinstitution of the kava products on the market might again be possible. The International Kava Executive Council, which presents the interests of the South Pacific kava producing countries in a fair evaluation of kava risks based on a scientific discussion of facts, has been working hard to provide new data to underline the inappropriateness of the kava ban. A tremendous mass of positive scientific evidence on kava safety was assembled by international scientists, and presented on the occasion of the International Kava Conference in Suva, Fiji, in December 2004. “We believe that the new scientific evidence and the constant political background work of the governments of the South Pacific states contributed to this new development”, said Dr. Joerg Gruenwald, Executive Director of the IKEC. The new decision is of course not the end of the story, mainly because there does not seem to be a change for the situation of the consumers and physicians. When kava was banned, the withdrawal of the products from the market created a distinct gap in the therapeutic arsenal of the physicians for the treatment of mild to moderate stress and anxiety related disorders. With the new decision, kava is still not made available to therapy. “Despite kava not being put back on the shelves for now, the decision is still a milestone, as now the administrative way to regular kava registrations is again open”, explained the kava scientist Dr. Mathias Schmidt from the IKEC. Only a few days ago, an application would not even have been considered for the registration process. “We are glad that the discussion is now re-opened, and we hope to finally come to a constructive dialogue with the BfArM”. The question of efficacy of kava is still a matter of debate. Among scientists, there is no question that kava is efficacious, and that the quantity and quality of clinical evidence is high enough to prove efficacy. This, however, reflects the general picture. Gruenwald: “The doubts raised by the BfArM do not concern efficacy of kava as such, but of individual products, based on technical flaws in published data.” The offer to re-evaluate the risk-benefit ratio based on valid new clinical data shifts the focus from toxicity to efficacy. If proper clinical evidence of efficacy is enough to overcome the current unavailability of kava products, the dangers from potential kava toxicity finally seem to be regarded as acceptable. Scientist always pointed to the fact that kava toxicity – if existing – occurred in an extremely low number of patients, by far below the incidence rates observed with many other freely available drugs. The kava drug producers will now discuss the possible ways forward, and evaluate the chances to provide data from a new and state of the art clinical trial. THE country's coconut industry is undergoing major reassessment, Agriculture and Livestock Minister Mathew Siune said. The new board of the Kokonas Indastri Koporesen (KIK) and the management team are currently reviewing the status of the coconut industry, with focus on funds and how the sector is being managed, Mr Siune added. Deloitte Touche Tohmatsu will do the audit of the KIK operations to determine if funds were properly used and ethics were maintained. Mr Siune said the audit report is expected to be given to the management next month. Mr Siune was reacting to warnings from Opposition Leader Peter O'Neil "that the ailing coconut industry will die unless the Government steps in and overhauls its management". Commenced funding certain coconut research and development activities of the Cocoa And Coconut Industry PNG due to a shortfall in budget support in 2005. KIK has allocated half a million kina to develop coconut seed planting materials and carry out downstream processing activities for smallholders this year. Has established better linkages with CCIPNG, the prime implementing agency for the coconut industry to manage all its R&D operations for the transfer of appropriate coconut technologies to smallholders. Assessed performance of exporters and buyers. The assessment records have shown that there is an increase in copra production. Is currently developing the National Coconut Development Programme with two coconut development seminars being held so far. Mr Siune said KIK has also made a commitment of K100,000 to resurrect the Hisiu project, while the Central provincial administration has injected counterpart funding of K100,000 so that the project could be developed into a resource centre that will address issues relating to cocoa coconut and other crops. He said to realise the huge potential of the coconut industry, KIK and CCIPNG will work with other key government agencies like Department of Agriculture and Livestocks, Trade and Industry and Investment Promotion Authority to develop strategies for production of various high value coconut products for domestic and overseas markets. "For KIK annual reports to be tabled in Parliament, financial accounts for KIK have to be audited before they can be included in the reports." The Auditor General's Office has only been able to audit the financial reports up to 2001. "The KIK Management is negotiating with the Auditor General's Office to have the KIK financial accounts audited up to 2004 by the end of 2005.A major annual report will be prepared for KIK for presentation in 2006 once the financial audits are completed," Mr Siune said. From Dr Lois Englberger of the Island Food Community of Pohnpei. As we shared with you previously, we are now carrying out a project in the village of Mand, Madolenihm, documenting the traditional food system of Pohnpei. Our team is an inter-agency one, involving Pohnpei Agriculture, College of Micronesia-FSM Land Grant, Pohnpei Department of Health, Pohnpei Historic Preservation Office, US Peace Corps, Japan Overseas Cooperation Volunteers, as well as the Island Food Community of Pohnpei. We were very interested last week to find out about a green leafy vegetable called "katuk". Kiped and Asipa Alpert have it growing near their house, and they explained that they had received it from the College of Micronesia-FSM Land Grant program some years ago (but evidently it was not widely distributed or promoted as our inter-agency team was not familiar with it). The Alperts explained that it can be eaten raw as a salad vegetable, or cooked. We tasted the raw oval-shaped leaves, and they were in fact quite sweet and tasty. Jackson Phillip was involved in the Land Grant program at the time of the introduction of this vegetable. We contacted him and he remembered it well and mentioned that katuk is known for reducing blood sugar. He pointed out that it is also good for diarrhea and stomach ache. I have now located a published leaflet on katuk by the University of Hawaii. This is the Tropical Perennial Vegetable Leaflet No. 10 by Jay Ram, August 1994. This leaflet identifies katuk as the sweetleaf bush, or Sauropus androgynus. It says that it can be eaten raw in salads or cooked, as in soups, stews, and stir-fry dishes. It states that one-half cup (100 g) of this vegetable provides the entire estimated requirement for vitamin C.
The leaflet also states: "It is suspected that Sauropus contains a substance which tends to lower blood glucose. If proven to be true, the plant may be beneficial to diabetes." So this vegetable could help in protecting against and controlling diabetes, one of the major health problems here in Pohnpei, and also could provide an important local vegetable both for eating raw in salads, as well as cooked, and easy to grow outside the house with other food crops. For those interested in getting plantlets of katuk, please contact COM-FSM Land Grant at 320-5731 or Pohnpei Agriculture at 320-2400. Thanks again to the Centre for Indigenous Peoples' Nutrition and Environment, McGill University, Canada, for their involving us in this project. There were several responses to the release on katuk, see below. Also, I want to share with you that it was Welsihter Hagilmai from the College of Micronesia-FSM Land Grant who carried out the interview in Mand and found out about the katuk. Thank you, Welsey! This plant reminded me those years I had with COM/Land Grant/Home Gardening & Cooking demonstrations program with homemakers in the villages. This plant reached even Salapwuk village. But I'm not sure people kept it alive in some places. I guess the promotion was not very strong in the beginning. Thank you Lois for sharing. I wish to share a few more with others. The 'reduce blood sugar' info regarding Katuk was made available to all CES nutrition staff and members of the Ieias Mwahu Committee (IMC). The discoveries of it as remedy for diarrhea and good for some stomach ache were here (myself). Katuk and Chaya were among the five vegetables and the Neem tree Jay Ram and I introduced through an ADAP project. Jay Ram is a private scientist and consultant on the Big Island. Anyone interested I can provide 100 cuttings every other day for the next 6 months. Through a combination of environmental stability and isolation, New Caledonia has a rich collection of endemic fauna and flora, including many relictual species that are extinct elsewhere. This association collects scientific information on these species and makes the information free to the public. The database on the Tracheophytes includes 3243 species, including 2407 endemics, with illustrations for 1174 of these unusual and ancient plants. PRESS RELEASE FROM KASTOM GADEN ASSOCIATION: A report from S.P. Lenga, Vice President of the Improved Temotu Traditional Agriculture Farmers Association. S.P. is a member of the Solomon Islands Planting Material Network supported by Kastom Gaden Association and he passed this news by HF radio from the Reef Islands, Temotu Province. An eight-month period of unusual weather has effected Reef Islands leading to severe food shortage. It appears to have been a long dry season since the middle of 2004 followed by a long and unseasonal wet season since february 2005. The result is that kumara, cassava, taro and other root crops have yielded very poorly and have now been exhausted. Usually breadfruit should be starting to have a lot of fruit at this time of year but instead there is very little. Breadfruit trees are looking very poor and many of the young fruit fall down black on the ground. To add to the problems, flying foxes have hit the remaining breadfruit crop much harder than usual without much left for people to eat. The trees have a few young fruits, but only a couple of the many varieties grown in reef islands are fruiting and many families do not have these varieties. The result is that there will not be enough breadfruit for at least a few months and up to five months and even then people will not have enough to process into Nambo, the dried breadfruit that usually sustains people at such times. 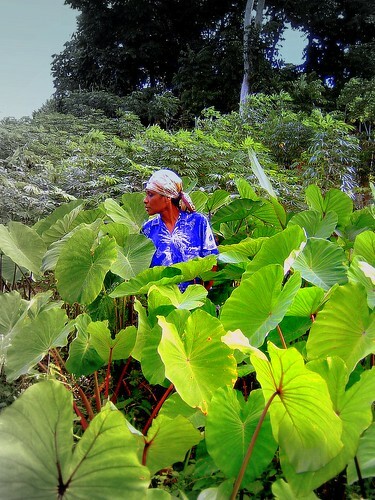 Many families lived off the wild yams in the bush and those they had planted in their agro forests, a tradition in Reef Islands, but since late last year they are all finished. S.P. believes that declining soil fertility has made the situation much worse along with the fact that many families are not planting enough of the traditional tree crops like breadfruit, polynesian chestnut and alite in enough quantity and the different varieties including the wild yams and greens underneath in the improved temotu traditional agriculture model. The big bush is all gone and the soils are being exhausted by over cropping from a growing population. The old people say they have experienced this type of season before and they used to prepare for it with processed foods like nambo and a wide range of tree and garden crops that they could live off. But people today have forgotten this knowledge. However, S.P. believes this is the worst season in his time in Reef Islands: 'every day people just wake up and think about what are they going to do today to feed their children. At the moment they are living off sea products, mangrove fruits, bush greens' (S.P. Lenga). 'Husbands and families in Honiara should think of their children at home - we need your help. ' said Mrs S.P. Lenga. Mrs S.P. said in past years with bad seasons families were able to look after themselves by buying food with the income they earned. But at the moment most families have very little money and just cannot afford to buy rice. Those families who work can buy rice and are doing OK.
S.P. believes that emergency food is needed and that is why they have been calling for help from the National Disaster Management Office. But in the longer term people need to plant more ITTA agro forests and learn how to improve the fertility of their land. He is concerned that many local varieties may be lost during this period. For example many families are eating all their pana and will have none for replanting. APIA, Samoa (Samoa Observer, May 3) – Nonu juice beat out fresh fish as Samoa's top export for the first time in February this year, according to new Central Bank of Samoa figures. Nonu is on the rise in revenue and market outlets, thanks to some hard work by producers. But the uncertainties that plague agricultural exports hover constantly and prevent farmers from plunging into all-out planting. Exported nonu juice surged twofold in earnings, to $632,000, as volume also doubled and prices rose 3 percent, the Central Bank of Samoa (CBS) said. Nonu fruit also rose strongly in export earnings in February - by $179,000 - to $269,000, thanks to an increase in volume that was nearly threefold, the CBS said. Managing director of CCK Trading Ltd., Ken Newton, a leading producer of nonu products, said exports are obviously increasing, but it is unclear if that is due to more exporters entering the fray. "There may be some new companies involved," Mr Newton said. The main exporters he knows of are CCK, Nonu Samoa Enterprises Ltd., and Richard Keil. "But as far as we're concerned we're seeing a big demand for dried nonu now," he said. Overseas buyers are turning them into capsules and "reconstituting" them into drinks, especially in the United States - after adding fruit, syrup and other ingredients. Mr Newton said he didn’t know why they went to all that trouble instead of just making a drink from nonu powder. He has tasted a sample of the drinks made overseas and his verdict is, it's "bloody terrible." "But that seems to be happening." Mr Newton would like some help from Government, something they haven't been getting much of. He has read a magazine article about all the incentives in tax Government is trying to attract overseas companies with, especially the ones in tourism. But try to get the same for his industry, like some help with the duty on processing machinery - nothing, he said. "You seem to run into a brick wall," Newton said. "You can't seem to get an answer to anything," he said. Producers like him know the potential of their product but say there appears no discussion about it within government. Said Mr Newton: "I mean you just don't hear about it." Perhaps Government officials are a bit hesitant to encourage nonu production because of what happened to the ava industry, he said. It collapsed, as is well-known. Producers writhed in financial pain. "I lost $500,000," Mr Newton said. Actually Treasury and the Agriculture ministry audited the ava stranded at CCK and valued it at $498,000, but to Newton, it was so close to $500,000 it didn't matter much. "That just sat in the shed and rotted," he said. There was no chance of it being sold locally - it would have taken years. "Not that quantity, no," said Newton. "The local market is too small." But the heavy losses then showed how risky exporting agricultural products can be. Mr Newton said ava was booming then vanished as an industry suddenly. It's suspected major pharmaceutical companies seeing sales of their products threatened by ava substitutes whispered - quite wrongly as it turned out - that the Pacific product was dangerous to livers and what not. Germany's Ministry of Health imposed a ban that spread to other European countries. Pacific companies producing nonu juice took note of that disaster and tried again to enter the European Union market. Some 30 companies took the initiative of grouping themselves into the Pacific Islands Noni Association (PINA) and set out to meet the stringent and multiple requirements imposed by EU's standards people. CCK joined PINA. "I'm vice-president," Mr Newton said. An EU aid body, the Centre for the Development of Enterprises, helped PINA get nonu juice accepted as a product for sale in Europe. "They were helping us get approval from their food standards people," Mr Newton said. After 18 months, they got the approval in December last year. Some 20 companies had to first meet a standardised plan for production, equipment, hygiene and a host of other requirements for the production of an herbal product such as nonu juice - including pasteurisation. CCK is scheduled to get its pasteurisation machine at a cost of $NZ 25,000 next month, Mr Newton said. He suspects supplies of nonu would not be enough if there is any "real explosion" in the industry. Nearly all the fruit being harvested at present are wild ones. Farmers do not know how well the market will treat them in the future, so hold back on all out planting. Exporters like Mr Newton, also unsure of what the future holds, hold back from promising growers their fruit will have a market come harvest time. "So it's a bit of a Catch-22, that one," Mr Newton said. Following the recent spate of articles about cyanide in cassava, here's a contribution from Prof. Bill Aalbersberg of USP's Institute of Applied Science which tries to summarize our knowledge and set the record straight. Cyanide occurs naturally in cassava (and other crops) as a glucoside. This is thought to be related to natural defence against pests. Cyanide, of course, is a potent poison and its presence in food crops has caused concern. Cassava has often been classed as “sweet,” or low in cyanide, or “bitter,” high in cyanide, though these correlations do not always hold. Concentrations in cassava range from roughly 10-1000 mg/kg of raw root. Pacific cultivars are usually classed as “sweet,” though during droughts Tonga reports they might taste bitter. Health effects are not simple to predict based on cyanide content of the cassava. First of all, total cyanide removal by processing is variable. Simple boiling, which removes 50-60% of the cyanide, is sufficient in the Pacific for low cyanide cultivars, whereas in Africa, with higher average levels of cyanide, traditional processing involves a complex process of grating, fermentation and frying. The fate of the remaining cyanogenic glycoside during digestion - that is, how much is released as cyanide in the body - is not well known. Cyanide in the body is mainly detoxified by reaction of sulphur-containing amino acids. The thiocyanide produced blocks iodine uptake by the thyroid gland. Thus, neurological disorders and lack of mental and physical development are the hallmarks of chronic intake of high cyanide varieties. More acute effects, even death, can occur if this is combined with improper food processing and malnourishment (lack of the sulphur containing amino acids). In this somewhat murky scientific situation, New Zealand regulators decided to “protect” their consumers from cassava poisoning by calculating a worse-case scenario that all cyanide in the cyanogenic glycoside of raw cassava ended up as cyanide in the body. With some safety factor, this yielded a figure of 50 mg/kg as the safe limit for cyanide in cassava. Using the data of Bradbury from the 1980s that all Pacific cassava cultivars fell below this level, it was felt that this regulatory level would create no barrier to the considerable trade of cassava from Pacific island countries to New Zealand. Unfortunately, the published research by Aalbersberg showing that most cultivars in Fiji contained more than 50 mg/kg and suggesting that the Bradbury samples were likely compromised during their journeys to his laboratory in Australia seems not have been consulted. Since then, Tonga samples have also been analysed and all mature cultivars are above 50 mg/kg. The absence of goitre in Tonga, which would be an early sign of possible health effects from cassava consumption, suggests that Pacific islanders can consume large amounts of cassava that have moderate levels of cyanide without apparent health effects. This suggest that regulators need to relook at this issue. By Richard Davis, SPC Virologist, in Pacific Islands Business. Kava dieback disease is the single greatest threat to kava growers in the Pacific. This devastating disease, which can destroy entire plantings, was first discovered on the Suva Peninsula in the 1930s. In Fiji today, estimated crop losses average around 40%. Regional research scientists working with biotechnology tools have uncovered the secrets of this disease which causes kava plants to “melt down” and die from a rapidly spreading black rot of stems. Checking...Nemani Tunidau and Apimeleki Motu examine an experimental kava plant. For over 50 years kava dieback disease remained a deep mystery for scientists working in the Pacific. Many fungi, bacteria and nematodes (tiny worms in the soil) were investigated as possible culprits. But one by one each was found not to be the cause of the problem. A major breakthrough was discovering that the kava dieback disease was caused by a virus called cucumber mosaic virus (or CMV for short). This was discovered in the course of Australian funded research in Tonga from 1987 to 1994 which also involved Fiji, Vanuatu and Samoa. Researchers found the virus in kava plants in all four countries. They then artificially infected healthy plants to prove that CMV was causing the dieback. The discovery that this virus was the cause of kava dieback, as well as being unexpected, was frustrating because virus diseases are hard to control. There is no simple cure, like a chemical spray, for viruses. Growers over the years have adopted a combination of management practices to deal with virus infections in their crops. CMV is especially difficult to control because it is so widespread, attacking over 1200 plant species. The virus is readily moved around in stem cuttings of kava, and easily spread by aphids. Growers were advised to remove all diseased plants by digging them out and burning them as soon as spotted. However, kava growers did not like to kill off their own plants. Individual plants are worth a lot of money. Also, farmers knew that following dieback some re-growth normally appears. Not much happened after this initial work and farmers continued to struggle with kava dieback. But in early 2002, with new techniques now available to researchers, the Secretariat of the Pacific Community (SPC) allocated funds under the European Union Plant Protection Project to once again look at kava dieback. The researchers were now able to use cutting edge tools of biotechnology to spot the presence of the virus, essentially the same DNA detection methods used in forensic police work. A small team was quickly put together, comprising researchers from the old campaign and new ones from the Fiji and Tonga agricultural ministries. The task of this team was to learn enough about the virus to be able to recommend a disease management package that would be acceptable to growers, to road test the package and then introduce the techniques to growers. Central to this second assault on kava dieback was the establishment of new laboratories equipped with virus testing biotechnology. SPC helped furnish two labs at Koronivia Research Station and at the University of the South Pacific's Institute of Applied Science in Fiji. The central mystery was: why has kava continued to survive in the face of CMV over so many years? With the aid of the new technology, the researchers discovered the likely answer. They found how the kava plant defends itself against the virus. Firstly, infected kava plants do not allow the virus to move around easily within them and, secondly, most new growths are free of the virus, a very unusual thing in the world of plant viruses. This breakthrough suggested that removing diseased stems as soon as they appear could offer effective control of the disease. By harnessing the natural ability of kava to fight off the virus and combining this with other management techniques, it is hoped the disease can now be conquered. To keep disease levels low in the field, growers must plant kava in amongst other plants that do not play host to CMV (intercropping). Small isolated plantings are best, using disease-free stock planted under shade trees that are non-host to the virus, in good kava soil so that the plants will be strong and better able to resist the virus. This package of best practices is now on trial in Fiji and Tonga. Disease-free planting material is a key part of the control strategy. Here again, biotechnology offers hope. Researchers at SPC's Regional Germplasm Centre have recently developed tissue culture techniques for kava. This will allow rapid multiplication of healthy kava plants for distribution to growers. The future looks bright for kava production in the Pacific. From Dr Lois Englberger of Island Food Community of Pohnpei. I would like to share with you about the 7th Oceaniafoods Conference, Wellington, New Zealand, 13-15 April, 2005. I will be presenting two oral power point presentations (see below). Also, I am taking preserved pandanus from the Marshalls and preserved breadfruit from Pohnpei to send to a laboratory for analysis for inulin, a natural dietary fiber present in many fruits. Dietary fiber has been associated with many health benefits, including that of protecting against diabetes. Objective: Vitamin A deficiency, anemia, and chronic diseases, including diabetes, heart disease, and cancers, are serious nutritionally-related health problems in the Federated States of Micronesia (FSM), Marshall Islands, and Kiribati. The purpose of this study was to identify locally grown acceptable foods rich in provitamin A carotenoids, vitamins, and minerals that could be promoted to alleviate these health problems. Method: Ethnography was used to select foods and food cultivars for analysis and to understand factors of production, consumption, and acceptability. The DSM Yolk Color Fan was used to estimate the edible flesh coloration. Samples were analyzed for provitamin A and total carotenoids using HPLC and selected vitamins and minerals using HPLC and standard methods (vitamins and minerals) and a microbiological method (folate). Results: The cultivars with greater yellow- and orange-coloured edible flesh had higher carotenoid levels. Many banana, giant swamp taro, breadfruit, and pandanus cultivars, and other staple foods, including apuch from FSM and te bero from Kiribati, were identified as rich in provitamin A carotenoids, meeting either half or all of the estimated daily vitamin A requirements. Some giant swamp taro cultivars were identified with high levels of zinc and other minerals, and the carotenoid-rich Karat banana had high levels of riboflavin and other vitamins. The fish liver of the species studied were all rich sources of retinol, but there were also great differences in the levels. Conclusion: Many locally grown Pacific Island staple foods have been neglected but are rich in micronutrients, including provitamin A carotenoids, vitamins, and minerals. Recommendation: Those acceptable staple foods rich in provitamin A and total carotenoids, vitamins, and/or minerals should be promoted for their role in alleviating micronutrient deficiencies and for possibly alleviating diabetes, heart disease, and certain cancers. Further work is needed in identifying other Pacific Island nutrient-rich locally grown foods. Ethnography should continue to be used in selecting locally grown foods for analysis, exploring social factors for reasons that these have been neglected, and for collecting information for planning promotion programs. Objective: In order to effectively communicate food composition data the right kind of promotional materials and messages are needed. This project developed a set of materials in order to promote locally grown carotenoid-rich foods and alleviate vitamin A deficiency, anemia, and chronic diseases (diabetes, heart disease, and certain cancers). The project included the Federated States of Micronesia, Marshall Islands, and Kiribati. Method: Ethnography, including key informant interviews, informal focus group discussions, photography, and observation, were used to select foods of potential carotenoid content and to understand factors of production, consumption, and acceptability. Photographic materials were developed to show visual differences between the white-fleshed (or lighter-coloured) cultivars of low carotenoid content and the yellow- and orange-fleshed cultivars of high carotenoid content, focusing on banana, giant swamp taro, breadfruit, and pandanus. The content of the most important of the provitamin A carotenoids, beta-carotene, expressed per 100 g edible portion, was presented under the photo of the edible flesh of each cultivar. One page presented the message that rice contains no carotenoid at all. Another page presented the health benefits of yellow-fleshed cultivars. Results: Great interest was shown in the materials by people of a broad range of professions and backgrounds, some requesting a fuller explanation of technical terms, such as beta-carotene. On the whole, respondents could see that the deep yellow- or orange-fleshed cultivars had the higher carotenoid content, while some were interested simply in seeing photographs of their own traditional foods presented in an attractive form or were interested in learning the cultivar names. Conclusion: This novel approach to presenting carotenoid data was effective in communicating health messages in Micronesia. Recommendation: This approach for communicating food composition data could be used in further Micronesian programs and possibly elsewhere to present nutrient content data and promote locally grown foods. There's an article in the latest ICT Update from CTA in which I make the case for this weblog as a means to disseminate news and information about plant genetic resources in the Pacific. The following is from Dr Lex Thompson, SPRIG Project Team Leader. In fact, in partnership with SPRIG/CSIRO, the Research Sections in the Forestry Departments in the Pacific Islands (Fiji, Samoa, Solomon Islands, Tonga and Vanuatu) are achieving outstanding improvement growth and other economically important characters in high priority tree species using conventional (non-GM) plant breeding methods. Endospermum medullosum (whitewood) in Vanuatu where growth rates of 22-29 m3 ha-1 yr-1 have been achieved for best provenance and family after 4 years (this is more than 30-50% greater than other sources). Santalum species (sandalwood) in Fiji where fastest growing hybrid trees have reached a height of 8-9 m and basal diameter or 20-26 cm and started forming heartwood after 6-7 years (these trees will produce high quality heartwood in about half the time of sandalwood from unimproved materials). Swietenia macrophylla (mahogany) in Fiji where families/provenances have been identified which grow 50% faster in wood volume than currently planted sources, and with outstanding stem form. Tectona grandis (teak) in Solomon Islands, where individuals from a clonal seed orchard have grown to 10 m height in just 14 months. Terminalia catappa (sea almond) in Vanuatu where plants from selected individuals have reached 17 m height in four years and began producing superior nuts within 18 months of planting. These results has been achieved through using simple domestication processes, involving selection of superior populations/individuals: in coming years conventional breeding will amplify these gains. SPRIG’s Pacific partners are adopting the same conventional breeding practices pioneered for tropical tree species by the Australian Tree Seed Centre/ CSIRO working in partnership with FAO, CTFT/CIRAD-Foret, DANIDA FSC and Oxford Forestry Institute and others. I hope this clarifies the approach to tree improvement within the Pacific Islands, and assisted by SPRIG/AusAID. A LAY preacher is praying that the good harvest she reaped last Thursday is a sign from the Lord of more good fortune in the near future. While Elenadi Cakau, of the Tomuka Methodist Church Circuit in Lautoka, has been growing root crops and vegetables all her life, the Daria villager from Bua was overwhelmed and surprised by the giant yams she pulled out of her three-acre farm. Ms Cakau, her uncle, Epi Soga and cousin, Erami Ravato had to dig for more than 30 minutes before they managed to uproot the 100-kilogram yam. "Since I moved here three years ago, I have been harvesting yams and other root crops. However, in the past whenever we harvested our crop, they were just small, nothing has ever been like this before," she said. "This is the first time that I have uprooted such large crops from my farm," Ms Cakau said. "This has also encouraged me to work harder to better my harvest next year." "I could not believe the size because my uncle and cousin had to uproot it together," Ms Cakau said. Apart from the 100-kilogram yam, Ms Cakau also uprooted two smaller yams that would be presented to her mother for Mother's Day and the head of Tokatoka Nawaqatabu, Sanoko Kinikinilau, who handed over the property that the church is occupying. Meanwhile, the prized yam would be part of the Tomuka Methodist Church's presentation to the Taukei Vidilo during the mini-conference at Namoli Village tomorrow. Ms Cakau, who is to be ordained a church ministrer at the end of the year, said she was hoping that the huge harvest was a sign for more luck. Ms Cakau said before she had settled on the seven-acre property, it was being used for a cane farm. She said the harvest was a huge relief for the church because it would be used as part of their presentation to the vanua. Along with yams, Ms Cakau also plants cassava, dalo, sweet potatoes, bananas and a wide range of vegetables on the farm. A 100 kg yam is a big one. Is it possible to show digital image of that yam? Or what species was it? Would Ms Cakau remembers the size of the seed material? Was that a one cycle yam? Hope I am not asking too much, but there are a number interesting things about this. In Pohnpei usually it is the men, and I have not seen a woman harvesting that size yam. Was it treated for Anthracnose or insects? On May 4, 2005, the John Simon Guggenheim Memorial Foundation held a reception to honor their new 2005 Guggenheim Fellows. Among the new fellows is Dr Michael J. Balick of The New York Botanical Garden, whose fellowship will support the preparation of a comprehensive manuscript on the ethnobotany of the Micronesian island of Pohnpei. Working with local ethnobotanists, the Pohnpei Council of Traditional Leaders, The Nature Conservancy, The College of Micronesia, and other international and local groups, Dr Balick has been documenting people’s traditional uses of plants on the island for eight years. This data will be compiled into a complete synthesis of ethnobotanical knowledge of Pohnpei. The Guggenheim award will enable Dr Balick to produce a first draft of this manuscript in 2006, for publication in 2007. Pohnpei, the highest and second largest of the Caroline Islands in the western Pacific, is part of the Federated States of Micronesia. It is one of the wettest and, until recently, most fully forested of the Caroline Islands. It contains the lowest elevation cloud forest in the world and is rich in rare and endemic species of plants and animals. The diversity of habitats, high rainfall, and deep weathered soils support more than 1,000 species of vascular plants. Since the first botanist visited in 1822, botanical and ethnobotanical information gathering on Pohnpei has been uncoordinated and sporadic. Today, as in other parts of the world, much of traditional knowledge, including an understanding of biodiversity, and its use and management, is being lost as modern culture spreads around the world. The book will contain introductory chapters on the botany of the island, agroforestry and food production, traditional forest management practices, traditional healing, ecosystem conservation, and the loss of specific knowledge about plants and their uses. This will be followed by an encyclopedic section on Ponapean flora, with detailed scientific nomenclature, common names, local and regional uses, and color photography. The book is planned to be the most detailed study of the traditional use of plants on any Micronesian island. It will support biodiversity research, conservation, and anthropological studies and be used in public health programs and local teaching. It will also help safeguard the intellectual property interests of the Pohnpei people. Dr Michael J. Balick is a senior scientist, curator, and research director at The New York Botanical Garden. He is the Philecology Curator and Director of the Botanical Garden’s Institute of Economic Botany and Vice President for Research and Training. He is the author of numerous books and scientific papers in ethnobotany and plant systematics, and serves as an advisor and trustee on the board of a number of organizations dedicated to ethnobotany and herbal medicine. Dr. Balick serves as an Adjunct Professor at Columbia University, New York University, Yale University, and City University of New York. Internationally, he has established numerous collaborations between communities, governmental and non-governmental organizations, and institutions in the United States and Europe, all working towards the common theme of discovering plants with potential therapeutic uses and was recently awarded the Award for International Scientific Cooperation by the American Association for the Advancement of Science. CASSAVA varieties found in Papua New Guinea are mostly safe for human consumption, the National Agriculture Research Institute said. The institute’s assurance came after recent reports of 27 children dying and more than 100 others being hospitalised after eating cassava, or tapioka, in the Philippines. The deaths were said to have been caused by cyanide poisoning from cassava that was not properly prepared. However, it was later found the poisoning was caused by a pesticide found in the cassava mixture that the victims had eaten. NARI acting director-general Dr Sergie Bang said research by the institute indicated that the PNG varieties have acceptable cyanide levels. The cyanide in the cassava can be destroyed by boiling or cooking. “The cassava varieties found locally are safe for human consumption. These include the nine high-yielding and drought-tolerant cultivars that NARI has recommended for farmer adoption,” Dr Bang said.He said the local varieties as well as those found in other Pacific countries were low in cyanide contents.But he cautioned that cassava can be poisonous if eaten raw or not properly prepared. The more dangerous were the bitter varieties found mostly in Africa and Asia. He said if people were uncertain then they should soak fresh tubers in water for at least three days before preparing to eat. He said the research by NARI also found that immature cassava tubers and tuber skin or peelings contained more cyanide than mature tubers and the flesh. “So, peeling would be encouraged and care should be taken in feeding livestock with fresh peelings,” Dr Bang said.